If your company has its own servers on site, then you know the importance of keeping your server room cool. If those servers overheat, they can experience damage and fail, leading to a wide range of problems. Keep a few tips in mind for ensuring your server room stays cool, including AC repair Kissimmee. In order to keep your server room cool, you need to know the appropriate temperature to have it set at. The main challenge you’ll face is keeping the technology cool without wasting energy. Industry recommendations suggest going with a temperature between 50 and 82 degrees Fahrenheit. The exact temperature that will work for you depends on the cooling needs of your servers, as well as the efficiency of your temperature-control system. It should go without saying that air conditioning is one of the best ways to keep your server room cool. Just remember that simply having air conditioning is not enough, as you also want it to be efficient. After all, it’s running 24/7 to keep the servers at their ideal temperature. Efficiency is an important consideration when selecting and designing your air conditioning unit; you can ensure efficiency through regular maintenance. This will help your AC unit function as it was designed to, at maximum efficiency. If you have any spots in your racks that do not currently have servers, put blanking panels in this location. Without blanking panels in place, the cool air in the room will move into the open space rather than the top of the server rack. With the panels in place, cool air travels up to the very top of the rack. Don’t forget to always keep the door to the server room closed. Otherwise, cool air from inside the room will escape, and warmer air from the rest of the building will enter, undoing all of your hard work and putting the servers at risk. 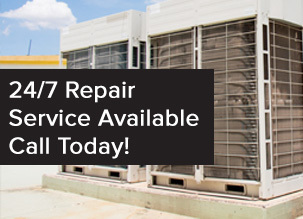 With AC repair Kissimmee services from All Temp, you’ll be on your way to ensuring your server room stays at the desired temperature all day long. Call 407-857-7800 or 813-630-9400 to make an appointment with our team.